Lake County -All lanes east bound at Cline Ave are closed due to three semi’s and one passenger car property damage. One of the semi’s was carrying a pontoon boat which is now on the interstate. Traffic is being diverted off at Indianapolis Boulevard. Police are asking the motoring traffic to avoid this area; west bound traffic is also backed up because of this crash. We are also experiencing numerous other crashes on I-65 and I-80/94 due to the weather conditions. None of these crashes are serious or involve personal injury. Roadways within the Lowell District are snow covered, slick and hazardous. The roadways are passable, but motorists must slow down, increase their following distance, avoid sudden lane changes and ensure everyone is buckled up. Additional snow is expected throughout the morning and drivers should expect hazardous conditions. Lake County, Hammond-A driver was seriously injured early this Monday, December 9th, 2013 morning, when they lost control of the car they were driving. Preliminary investigation by Trooper John Holmen revealed that at approximately 1:55 a.m., a black 2000 Mercury Mountaineer was west bound on I-80/94 just east of Cline Avenue when the driver was going too fast for road conditions (snow covered and slick in spots) and lost control. The Mountaineer spun out, went off the road and hit the inner barrier concrete wall. This caused the Mountaineer to bounce back onto I-80/94 where it came to rest in the middle lane. A 2000 Freightliner pulling a soft sided trailer, owned by Vans Delivery Service out of Grand Rapids, Michigan and loaded with building material, driven by Michael W. Wilkins, 42 of Delton, Michigan was west bound and could not avoid the Mountaineer. The Freightliner after hitting the Mercury went off the road hit the inner shoulder concrete barrier wall and came to rest in the left lane. The driver of the Mountaineer was ejected from the Mountaineer and came to rest in the left lane of the roadway. The driver was taken to Munster Community Hospital in Munster with critical life threatening head injuries. Family has NOT been notified. The driver was not wearing a seat belt. Wilkins was taken to North Lake Methodist Hospital in Gary with non-life threatening injuries. All lanes west bound were closed with traffic getting by on the outer shoulder until approximately 04:30 a.m. when all lanes were reopened. 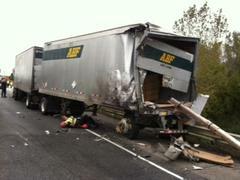 The lanes were closed for reconstruction of the crash, removal of the injured and vehicles and clean-up of the roadway. Additional information concerning the Mercury’s driver will be forthcoming after family has been contacted. UPDATE: Driver has been identified as Andrea Taylor, 21 of Chicago Ridge, Illinois. Taylor was taken to Advocate Christ Medical Center in Oak Lawn from Munster Community Hospital. To help Hoosiers prepare for this the Indiana State Police offers the following tips. 	Clear all vehicle windows of ice and snow. Remove snow from hood, roof and lights. 	Avoid abrupt stops and starts. Slow down gradually. 	Don’t leave your car. It’s the best protection you have. IN Hammond, (Lake County) Early this morning a Beecher, Illinois man out celebrating the evening before disregarded all the traffic control devices in the overnight work zone set up on I-80/94 east bound east of Calumet Avenue.At approximately 3:24 a.m., this Thursday, October 24, 2013, morning, Sergeant Wanda Clay who was working traffic security for the work zone construction being done overnight on I-80/94 east bound saw a 2005 Ford Explorer drive in between the construction barrels behind her and stop to talk to a construction worker in his vehicle. The exit lane, right and right middle lanes were closed in this area for the overnight construction leaving the left two lanes open for motoring traffic. The area was well posted, with signage, barrels, traffic control devices, construction workers and vehicles.Clay was sitting in the right middle lane in construction with all of her emergency lights activated less than ½ mile from the workers up ahead. As she watched the Explorer come up behind her she thought he might have been a worker until she realized his vehicle didn’t have an amber light on it. The Explorer passed her police car and was approaching a construction semi-tanker loaded with water sitting in right lane as she took off after it. The semi was blocking the Explorer when it attempted to move to the right middle lane to get around it. The semi was able to maneuver itself to block the Explorer as Clay approached to stop it; as there were workers out working in front of the semi.The driver of the Explorer identified as Kyle C. Ohlendorf, 23 of Beecher, Illinois had been out celebrating the night before and stated he was “lost and confused” when he went around the barrels to talk to the first construction worker.Ohlendorf was cited for Failure to Obey a Traffic Control Device in a Work Zone and Operating While Intoxicated Refusal. He was taken to Lake County Jail. (Indiana Toll Road) traffic. Preliminary investigation by Trooper Aron Weller revealed that at approximately 10:55 a.m., this Tuesday, October 22, 2013, morning a 2009 Kenworth pulling a tanker, driven by Dave A. Donervse, 32 of Paw Paw, Michigan was west bound in the right lane just east of the I-80/94/Ripley exit on the Toll Road. to pull Donervse from his cab. Donervse was taken to Saint Mary’s Medical Center in Hobart with serious injuries. His tanker was owned by Rose Cartage Services out of Lansing, Illinois and loaded with salt. There was no load lost. semi was owned by ABF Freight Systems out of Waterbury, Connecticut. by Reba Transport out of Berne, Indiana and was loaded with furniture. of the roadway. Both lanes of traffic are expected to be re-opened shortly.